The holidays have us pretty busy, so here is our Microscope Buyer’s guide for those seeking to buy one! Congratulations! You’ve decided to buy a microscope! A microscope is a wonderful instrument that can fascinate kids and adults alike. With proper care, a microscope can last a lifetime. But buying a microscope can be confusing for the first time buyer. There are so many different designs, it can be a bit overwhelming. This guide should help you make the proper choice in deciding on a microscope model. First let’s start by discussing the different designs of microscope. We will break microscopes into three different categories: Compound Microscopes , Inspection/Dissection Microscopes, and ‘Other’. We’ll cover these one by one. Compound/Biological Microscopes : Compound (or Biological) microscopes are the models designed to be used with slides. They are high powered; using multiple objective lenses (the lenses that point at the slide) to typically provide 40X, 100X, 400X and sometimes 1000X right off the shelf. Modern compound microscopes usually have some sort of illumination from below to light up the slide. Depending on the design of the compound microscope it may have features like binocular eyepieces (two eyepieces, but do not provide stereo vision) a mechanical stage for moving the slide easily, coarse and fine focus (for easy focusing) and different lighting designs. The disadvantage of a compound microscope is that you pretty much must use it with slides. You can’t just plop a bug, coin, or plant leaf onto the microscope and expect to get a decent image. Compounds aren’t designed to do that. You can cut up the leaf/bug/whatever and make it into a slide with some effort and a slide-making kit, but that does take some time and only lets you view s small part of the the found object. Inspection/Dissection Microscopes: Inspection/Dissection microscopes are designed to be used with any object you can fit on the microscope’s staging area. This can be coins, stamps, bugs, plant parts, circuit boards, small animals, or whatever else you might find. Inspection Microscopes often have much lower magnification (10x-40x is typical), much wider viewin g fields, and very often the binocular versions give true stereo vision. This allows the viewer to ‘work’ (I.e. dissect) on the object being viewed and get a true sense of depth of objects like coins. Inspection Microscopes may have only 1-2 levels of magnification verses the 3-4 on compound microscopes. The microscope will also have top-down lighting, and some may have bottom-up lighting as well. The eyepieces used in many mid-range inspection microscopes are often larger and more comfortable to use. The disadvantage of a compound microscope is that its magnification is very low and you cannot use it with slides. That means if you want to see cells, bacteria, or other very tiny objects you will need to get a compound microscope as well. Viewable Objects Slides Coins, stamps, bugs, plants, circuit boards, etc. This chart should give you some idea of the basic comparison. Hand-Held Microscope: These are small, pocket-sized microscopes used in a fashion similar to Inspection/Dissection microscopes. They may have higher magnification than Inspecti on microscopes (30-100x power), often have a built in light, and are light and portable. Their main disadvantage is they have a limited viewing field- you must put the scope directly on the object being viewed. Their optics & lighting are also rarely up to the quality of full-sized microscopes, and moving to find a specific part of an object can be tricky. Still they are great in the field where a full-size microscope would be unwieldy. Digital Microscopes: Many traditional microscopes can have a digital camera built into their structure, or can have their eyepiece replaced with a digital camera. But some microscopes are designed from the ground up to be used as high-power digital microscopes. These items have no eyepiece, only a CCD camera and an objective lens. They may have fixed or variable magnification, and the computer screen resolution will vary from model to model. Many ‘toy’-like designs have VGA quality graphics, which is 480 x 640. This level of quality is acceptable for kid’s use but is not sufficiently detail for any real work or study. Usually 1.3 Megapixels is the highest quality available for devoted consumer digital microscopes. If you desire higher resolution a compound microscope with a digital microscope eyepiece might be in order. High Power Magnifiers: A hand-held magnifier is a very different instrument from a microscope, seeing as how most magnifiers have about 2-3x magnification and microscopes can go as high as 1000x. But some close work magnifiers have very high power (10x and up) and the line between a microscope and a magnifier starts to get blurred. As far as optical design goes, they are still very different animals: The magnifier has just one lens (or set of cemented lenses) while the microscope has both an objective and eyepiece lens. Although the difference is there, the jobs they cover get blurred. If you need a lower powered microscope or a high power magnifier, make certain you are choosing the correct tool for your viewing needs. Hybrid Microscopes: Given the difference in use between a compound and an inspection microscope it didn’t take to long for some folks to come up with a design that tries to do the job of both microscopes. Usually this is done by taking a compound microscope design and adding a top-down light to the system. These designs can be a great boon to parents or buyers who cannot decide which usage they would prefer. The disadvantage is that like many other things that try to do multiple jobs, they are not the best at either job. Most often hybrid microscopes are better at being a compound microscope than an inspection microscope (mostly due to the higher powers of a compound microscope), but at least the option for using the microscope both ways is available. Consider a hybrid if you can’t decide between designs, but remember it won’t do the job as well as a devoted microscope. Toy Microscopes: Many ‘toy’ microscopes are available on the market, usually they are either plastic hand-held models or plastic versions of compound designs. The former can be great fun for small children who would like to have something to view nature close-up but can still handle their not-always-delicate hands. The latter, however, is usually to be avoided. Cheap plastic bodies and cheap plastic lenses will give the viewer a very poor experience indeed. Companies that make these items often pile on junk accessories like plastic ‘viewers’, poor slide making accessories, and other gimmicks to cover the fact that the instrument is junk. Avoid these if at all possible. DIN Objectives: DIN stands for Deutsches Institut für Normung – Don’t worry about that. Just understand that DIN eyepieces are set to a higher standard the the average beginner microscope. DIN objectives are generally universal so you can take one DIN objective out of one microscope and thread it into another. DIN eyepieces are often a bit more costly. Digital Microscope Eyepieces: Digital eyepieces can be a great boon to your viewing experience. When plugged into a computer they can be used to view objects on a much larger screen, and the images can be saved, modified, emailed, etc. Some digital eyepieces can make movies as well. Some microscopes have digital eyepieces built into the body of the microscope, but almost all non-toy microscopes can have their eyepiece’s removed and replaced with a digital microscope eyepiece. The image quality from a digital microscope eyepiece can go from VGA (or even TV) quality all the way up to 5.0 Megapixels or even more. Prepared Slides: Professionally made slides are always excellent to have around. They let you see objects with a quality that few can match. They also may be of specimens that may be very hard to obtain. Consider having a few prepared slides to enjoy. Slide Making Kits: Sooner or later you will want to make your own slides. This will involve blank slides, coverslips, a razor (for cutting samples) and some mounting medium. These can be bought individually, but it is often more economical and convenient to buy a kit. Special Slides: Blank slides with concave dips can be obtained for holding liquid samples. This is excellent for examining microscopic life in pond water and other sources. Slide Boxes: Once you make your own slides you should store them properly in a slide box. Don’t leave them to get dust and scratches. Microtome: If you make a lot of slides, cutting thin sample sections with a razor can get annoying after a while. A microtome can help. It is a mechanical device that helps cut a thin sliver off the sample. Think of them as working like the meat slicer at your deli only on a much smaller scale. Microtomes can be hand driven devices for around $75 to fancy automated item costing hundreds or even thousands of dollars. As mentioned above, before you decide on what model microscope you want, make sure you know what it is you want to do with it! Fun can be had viewing both prepared slides and making your own slides using a compound microscope. But it can also be a real thrill to take objects straight from the backyard, or even from your pockets and put them under an Inspection/Dissection microscope. If you have needs beyond having fun observing (research, coin collecting, etc), make certain that your microscope does that sort of job first and foremost. For decades Fischer Technical has produced the powerful High-Vacuum 3CFM pump which comes on its own or with a 0-30.00″ Hg Gauge. These are powerful instruments, able to run continuously for long periods of time and capable of producing a near perfect vacuum in most cases. We’ve carried these units for almost as long as we have been open. A popular set is the Vacuum Experimental Kit which is used by many educational institutions. 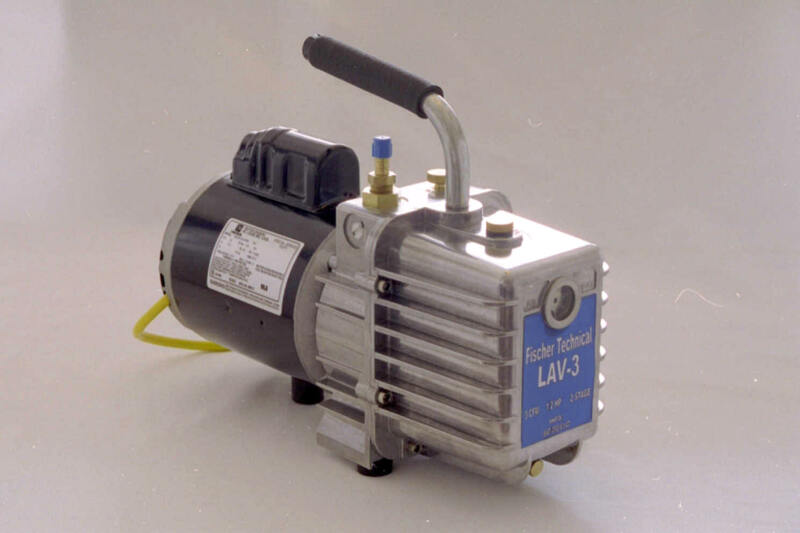 These pumps are designed to pump 3 cubic feet per minute (3 CFM) which is pretty good, but could be better. That is why Fischer has recently introduced higher-powered models that can pump much more than their classic model. These new pumps can fill the need for faster pump down and can handle larger gas loads. All can get as close to vacuum as you could want (better than 28″ Hg ). They can be used for vacuum casting, vacuum ovens, dessicators, impregnation. They are ideal for a lab’s vacuum needs. Fischer Technical Vacuums are must more affordable than the competition: Manufacturers like Welch, Cenco & Leybold. Their comparable models can cost 4-10x as much as the Fischer line. Somewhere in 2008-2009 a few people started realizing that a bunch of spherical high-powered neodymium magnets were lots of fun to play with. They were an excellent ‘fidget’ toy. They could also be used to make different structures and were overall a lot of fun. By the time you read this, BuckyBalls will be a thing of the past. Less than two months ago BuckyBalls announced that they would no longer sell to stores in order to control who buys it. Then, less than two weeks ago, they announced that they would no longer produce BuckyBalls or BuckyCubes. The few sets that remained would be sold online only. In effect, the company was being put out of business. Why? The CPSC (Consumer Product Safety Commission) initially was satisfied with BuckyBalls efforts to restrict sales to children back in 2010, this year they decided the measures were not enough and demanded that BuckyBalls cease selling them altogether. BuckyBalls was essentially regulated into oblivion. The reason for this action was that there had been incidents where children swallowed the magnets. Swallowing one magnet is not a problem, but swallow two or more and they will ‘pinch’ in different parts of the intestine. There were no deaths but the surgery to resolve this is messy and complicated. There were some 2 dozen incidents out of 2.5 million sets of BuckyBalls sold. In all cases the swallowing was done by children (usually pretending to have tongue or facial piercings) who were not supposed to have the BuckyBalls per the warnings from the company. There are other companies that produce spherical magnets, but the quality seems to vary from company to company. One set we got as a sample lost its nickel coating very quickly and tarnished. Another lacked the ‘power’ that makes BuckyBalls effective. A further one seemed to use regular magnets with nickel coatings so that it resembled BuckyBalls but was not. We are saddened by the loss of this product. While it is bad that some kids were injured it should also be noted that BuckyBalls took great pains to keep kids from getting them. It seemed like each week we would get another set of stickers and instructions on who and how to sell BuckyBalls. In all the medical cases the product was being used improperly, and by people who should not have had them. If you still want some, as of this writing BuckyBalls had a few thousand units remaining that they are selling solely on their own website www.getbuckyballs.com. What’s in the Soil? A classroom soil-testing kit. We have been adding more classroom items of late, and one of interest is the ‘What’s in the Soil’ kit from American Educational. The kit is large enough for 30 students to run tests. Using ordinary soil, students perform test such as soil nutrient & mineral analysis (testing for over 10 nutrients & minerals) to determine the effectiveness of plant growth. Students also will determine water content, organic matter content & pH levels. Several soil samples are included in case local soil does not have enough variation. The kit includes a 9 page teacher’s guide and covers 12 different activities. The kit is designed for students from grades 6-12 9age 11-18). We’ve added a small line of products: The HABA Terra kids model kits. 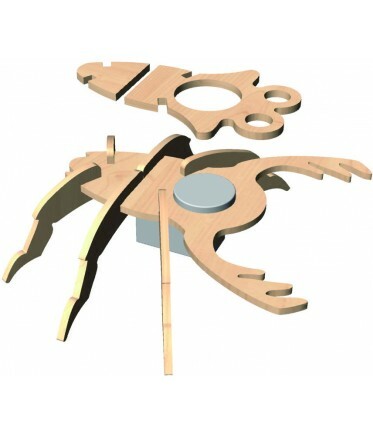 These are wood models you punch out the pieces and assemble to make working wood rubber-band powered models. The Prawn is put together, much like the Beetle, but instead of skittering it twirls around. This kit is again pieced together from wood punch model pieces. Once assembled the motor will race the car without batteries, just rubber band propulsion! Watch the car getting put together and zoom across the table! As a company, HABA has been making children’s toys for decades, usually in Europe. These are the first products they have developed that we found were good for our product line. Chek them out! These are just a couple of examples of the shapes that can be made with the pieces. Since there are 324 ways for the Tectonic hinges to connect the possible arrangements is huge. We won’t say infinite, but its pretty darn high!. Tectonic Toys are just $20 a set and great for kids or adults who enjoy construction. Each set has 48 pieces – 8 of each color.